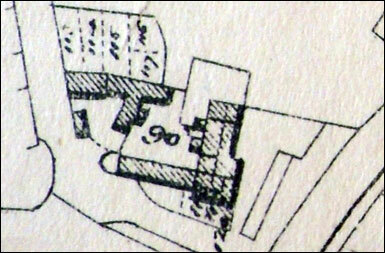 The map used here is from1843 but the layout of the houses is the same. including Mrs Andrews, who is remembered for her piano lessons. in their Sunday best, c.1900. 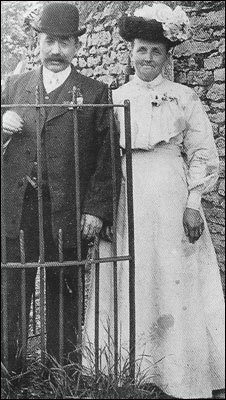 They were married at Yardley Gobion on 8 August 1881. The photograph was taken at the kissing gate near the Barley Mow public house. They lived near by at 4 Blacksmiths Yard, now a car park. the Blacksmiths Cottagesin the Barley Mow carpark. Kelly's Directory 1890 Henry Atwood , Barley Mow P.H. Kelly's Directory 1903 Thomas Bushell, Barley Mow P.H. Kelly's Directory 1906 Thomas Bushell, Barley Mow P.H. Kelly's Directory 1910 Thomas Bushell, Barley Mow P.H. Kelly's Directory 1914 Thomas E. Bushell, Barley Mow P.H. Kelly's Directory 1920 Henry Percy Keech, Barley Mow P.H. Kelly's Directory 1924 Malcolm Eckford Jelley, Barley Mow P.H. Kelly's Directory 1928 Arth. Andrew baker, post office & Barley Mow P.H. Kelly's Directory 1931 Louis Wltr. Dymond Barley Mow P.H. Newspaper 1972 Mr. George Parker Becket of Rotherham. Paul Adams 2013 Paul and Margo Adams. A MESSUAGE or TENEMENT, in good Repair, with Yard and Orchard, planted with Fruit and other Trees, situate near the said Barley Mow, adjoining the Grand Junction Canal, in the Occupation of Robert Dunsby. Immediate Possession will be given, if required. Saturday the 25th September, I8I3, at Three o'Clock in the Afternoon, at the Sign of the Barley Mow, Cosgrove aforesaid, in one Lot. A Newly erected substantial Stone and Slate built DWELLING-HOUSE, now occupied in two Tenements ; comprising three Rooms on the first Floor, four Bed Chambers, excellent Cellar, Wood Barn and Out-offices; a Well of good Water, with a Garden and Orchard adjoining, well planted with choice Fruit Trees, and several thriving Elm Timber Trees growing thereon.The Orchard contains 2R. 23P. ; the Grand Junction Canal adjoins the Orchard, which makes the Situation desirable for any Person in Trade that requires Water Communication.The above is situate near the Centre of the pleasant Village of COSGROVE, in the Occupation of Mrs. Jane Stevens and Wm. Law. Possession of one of the Tenements with the Orchard, &c. may had at Michaelmas next. For a View of the same, apply to Mr. Stevens ; and for further Particulars, to Mr. Kirby, Solicitor, Towcester or to the Auctioneers in Stony- Stratford. On the 8th instant, at Cosgrove, in this county, after a severe and protracted illness, Mr George Griffin, of the Barley Mow Public-house, aged 52 years. in the County of Northampton, Victualler, deceased. ALL persons indebted to the said GEORGE GRIFFIN, are required to pay the amount of their respective debts to Mrs Rebecca Gibbins, or Mr Daniel Warren, both of Cosgrove aforesaid, the Executors, within ten days from the date hereof. And all parties having claims upon his estate, are required to send the particulars thereof within the same period, that the same may, if correct, be forthwith discharged. BARLEY MOW INN, COSGROVE, Northamptonshire. THE whole of the HOUSEHOLD FURNITURE and Effects, except Stock-in-Trade. The Sale will commence at Eleven o'clock, and catalogues may be had on the premises, or at the office of Mr. Durham, Stony Stratford. We the undersigned being owner and occupier of the Public house known by the sign of the Barley Mow situate in the parish of Cosgrove and County of Northampton do hereby Certify that the said Inn or Public house together with the offices courtyard and garden therewith occupied and held at a Yearly rent of Eighteen pounds ten shillings and no more. An inquest was held before R. Weston, Esq., on the 25th July, at the Barley Mow, Cosgrove, on the body of Thomas Wright, aged 7 years, son of Thomas Wright, a labourer at the station at Wolverton, who, on the previous evening, was drowned the Grand Junction Canal at Cosgrove. The deceased, when bathing with two other lads got out of his depth; an alarm was given, and Noah Kirk, who was near, went into the water and fetched him out. He had then been in the water about 15 minutes, and there was no signs of life. A verdict of accidental death was recorded. Zilpha Wilson - I am the wife of Edward Wilson, now lying dead in this house. We lived at Yardley Gobion, two three miles from Cosgrove. He was a labourer, and is 36 years of age. We have six children. Between five and six o'clock on Tuesday evening, the 14th inst., he left home to go Cosgrove, to pay Mr. Warren for some beer. He was then quite well and sober. He did not return at night. About the middle of the next heard he was drowned. Josiah Lowel am 15 years old. I work for the Grand Junction Canal Company, at Cosgrove. About 11 o'clock yesterday morning, I was going over the trunk of the canal about half-a-mile from Cosgrove. I saw the body of a man in the water. He was taken along by the side of a boat to Cosgrove lock, and then taken out the water and brought to this house. He was dead. He did not appear to have received any violence. The trunk passes over the river Ouse, and there is a fence between the towing path over it and the canal. He would have pass over the trunk from the Locomotive to Yardley. Daniel Warren- I am a brewer at Cosgrove. A little after six o'clock, on Tuesday evening, the deceased called at my house and paid me three beer bills, amounting to 16s. 10½d. He gave a me sovereign, and I gave him the change. I did not see any more money. 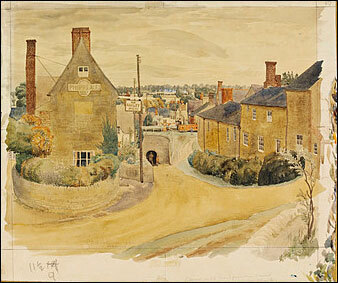 George Masters - I keep the Barley Mow Inn, at Cosgrove. The deceased came to my house about 7 o'clock on Tuesday, he left a little before 5 o'clock with a person to direct him the way to the Locomotive at Wolverton. He was perfectly sober. It was a very dark night. Joseph Foster - I am one of the constables of Cosgrove. I have seen the deceased pockets searched by his wife. She found his purse with a shilling in it, and three of Mr. Warren's bills for beer. From the Locomotive at Wolverton, he would have to pass the trunk. 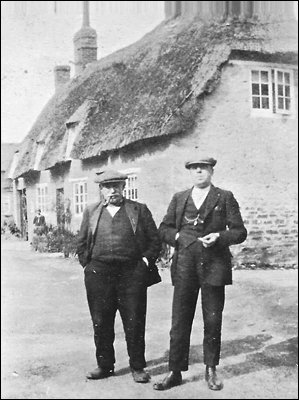 An inquest has been held the Barley Mow, the village of Cosgrove, Northamptonshire, before Mr. Arthur Weston, deputy coroner, on the body of the Rev. Charles Styles Drake. It appeared from the evidence that deceased (who was Fellow of Jesus College, Cambridge, and resided with his father, Admiral Drake, Castle Thorpe, near Cosgrove) dined with Mr. Francis Thursby, at Cosgrove Priory. He left there in his usual health, at twenty minutes past ten o'clock at night, to walk home to Castle Thorpe. His nearest way was along the towing-path of the Grand Junction Canal, into which he must have fallen. His hat was found the next morning floating on the water, and the canal was dragged, but the body was not recovered until three o'clock on Saturday afternoon. The deceased had in his pocket, when found, a watch, money to the amount of £9 0s. 6d., a post-office order, and various other papers. He was forty-four years of age, and unmarried. Death by Drowning. We this week record the untimely death of the Rev. Charles Styles Drake, son of Rear-Admiral John. Drake, of Castlethorpe. The unfortunate gentleman had been spending the day (Thursday, November 22nd) with F. Thursby, Esq., of Cosgrove Priory, and on returning home, owing the meadows being flooded, he did not take the direct path, but proceeded along the towingpath of the Grand Junction Canal, into which he appears have some means fallen, as he was found about midnight by some boatmen lying at the edge of the water exhausted state. He was picked up and placed against the further edge of the path whilst the boatmen proceeded to the locks for aid. The night watchman was immediately sent off to the spot, but no traces of deceased were to be seen. Inquiry was then made at Castlethorpe, and it was found he had not reached home, fears being entertained that he had fallen into the canal. Early on Friday morning they commenced dragging for the body, and continued the whole day without finding it. The dragging was resumed on Saturday morning, and after some time the body was found and taken to the Barley Mow Inn, Cosgrove, to await the Coroner’s inquest, which did not take place until Tuesday, as it was necessary to have the attendance of the boatmen, and a messenger was sent to Woolwich for them. After hearing the whole of the evidence that could be produced, a verdict of accidental death was returned. The deceased gentleman was 44 years of age. I write to inform you that we commenced Mr Dawson’s building today (Friday), but Mr Dawson and Toombes both say that it will be useless to build it at 13ft as they cannot get their things in, and I did not like to give them any orders without your permission, so I thought I had better write to you Toombes thinks it cannot be done without going 14ft, or 14ft 6 inches. If you would be so kind as to let me know exactly your measure it shall be done accord to your orders. pro J. C. Mansel Esq. I hereby give you Notice that the Landlord of Mr Dawson has a claim on him for the rent and which I shall be obliged by your paying before handing over the proceeds of Sale on Thursday the 26th inst. Edward Fisher Agent for John C. Mansel Esqr. Before you enter into any agreement with J. Dawson I should like to have some conversation with you respecting that person, I do not at present see why my property should be saddled with him, as I know it is hopeless expecting any rent from him, he is completely illeg up and I fear his father will soon follow. Old StratfordJohn Smith, of the Black Horse Stratford, was summoned by the same inspector for having certain unjust measures his possession. Convicted in penalty and costs, £2 7s. 3d. Cosgrove. George Jackson, of the Barley Mow Inn Cosgrove, was summoned for a similar offence. Mrs. Jackson (defendant's wife) answered to the charge, stating that her husband could not possibly attend, he being at trade as an engineer. She told the Bench she had been in the habit of selling beer for above a year and nine months. Convicted in penalty and costs, £1 2s. 9d. WOLVERTON. Stony Stratford Petty Sessions, Jan. 13th. Present, Rev. H. J. Barton, chairman; Rev. R.N. Russel, J. C. Mansel, Esq., and Rev. R. W. Scurr. JOHN BIGNELL (36), gasfitter, was charged with stealing shawl, value 7s, the property of Lucy Woodland, at Cosgrove, on the 28th December.Mr. Athawes prosecuted. Prisoner was undefended. 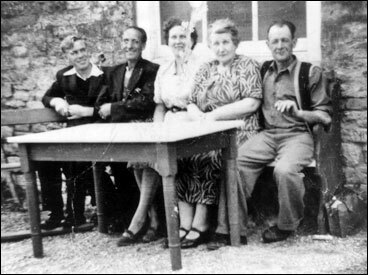 Lucy Woodland, barmaid at the Barley Mow, Cosgrove, deposed that the shawl produced was hers. She last saw it safe in her master's house on the 26th December, about seven o'clock in the morning. The same morning, at nine o’clock, prisoner was there. Two days after that she missed the shawl. She next saw it when the policeman brought it to her. By his Lordship : There were other people in the house on the morning of the 26th besides prisoner. By the prisoner : You were there all day on the 26th, and part the next dayin and out. His Lordship having summed up, the jury returned a verdict of guilty. The prisoner, who also pleaded guilty to a previous conviction, was sentenced to Seven Years' Penal Servitude. John Mason was summoned by police constable Fowler for being drunk at Cosgrove on Sunday night, the 29th of April. The defendant pleaded not guilty. PC Fowler deposed to seeing the defendant drunk on the public streets at Cosgrove on the night in question. Mason was also making use of very bad language. Defendant called two witnesses to prove that he was not drunk. Daniel Adkins said, I live at Yardley, and was with Mason at Cosgrove on Sunday night, April 29th. Mason was not drunk. Joseph Partridge, landlord of the Barley Mow Inn, Cosgrove, said defendant left his house at twenty minutes to eleven at night. He was quite sober. Lot 1. A Newly-erected MESSUAGE, let in Tenements, adjoining Cosgrove Green, with good Garden and Appurtenance thereto belonging, and a COTTAGE at the back of the said Messuage. The premises are in the occupation of Mrs. Baldwin and others. Lot 2. All those TWO Brick-built and Slated COTTAGES or Tenements, adjoining Lot 1 and the Village School, with Gardens and Appurtenances thereto belonging, in the occupation of Edward Coleman and Thomas Coles. STONY STRATFORD. PETTY SESSIONS, July 17th. Present, Rev. H. J. Barton, chairman, and C. Morrell, Esq. Cosgrove. John Foster, of Cosgrove, was summoned by John Partridge, landlord of the Barley Mow Inn, of Cosgrove, for refusing to leave the said Inn when requested to do so, on the 2nd of July.-Convicted. Fine £1, and 14s. 6d. costs. PETTY SESSIONS, Friday, May 7th. Present: Rev. H. J. Barton (chairman) and J. C. Mansel, Esq. Cosgrove. A Serious Charge. John Foster, of Cosgrove, was summoned before the Bench by Sarah Ann Eakins, a domestic servant, whose parents reside at Castlethorpe, charged with having assaulted her. Prosecutrix deposed: I have been living at the Barley Mow, at Cosgrove. On the 30th of last month the defendant came into the Barley Mow about half-past eight o'clock in the morning, and was there till about half-past ten. He came again about two, and wanted to know what master had been doing. I left Mr. Foster and mistress in the bar at ten minutes after two. Foster kept quarrelling all the time with mistress; at last mistress went upstairs. When I was in the bar he pushed me into a chair, and assaulted me. I shouted to the mistress, but she would not come down, and said I had no business to go into the bar, and that he might do what he liked to me. I went into the bar to mind it. Cross-examined by Mr. C. C. Becke, who appeared for defendant: I went to my master next day for my wages and clothes. He had previously assaulted me in the presence of my mistress. He once threw me down in the tap-room, and pulled my clothes over my head. Mr. Becke made a most able defence for his client, and called Mr. Partridge, landlord of the Barley Mow, said he was at home all the day. He never heard that Foster had been quarrelling. The prosecutrix told him she would not stop to be assaulted by Jarvis and Foster. His witness said he had seen men kiss her, and one man over 60 years of age, Copson, of New Bradwell.The case was adjourned for a fortnight, in order that Mrs. Partridge might be present. On Saturday last the smiths, &c., the works had their bean feast. They proceeded in four vehicles (in one of which was a horn playing) to Buckingham, where excellent dinner was provided at the Three Cups Inn. The whole party, numbering about 80, returned about eleven p.m., having spent a very enjoyable afternoon and evening. On the same day the workmen in the west-side paint shop had a cricket match and dinner at Cosgrove, where a first-class spread was provided by Mr. Smith, of the Barley Mow. 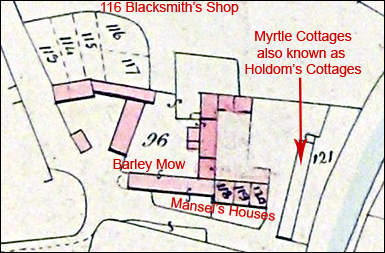 Dancing, &c., was kept up with great spirit till ten p.m.
On the premises of Mr. J. Smith, Barley Mow Inn. 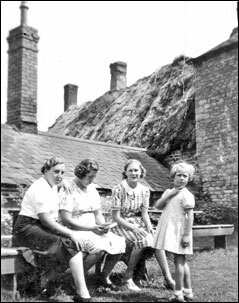 FIVE Stone-built FREEHOLD COTTAGES, in the occupation of Messrs. Lake, England, and others. The above Property is in a good state of repair, with good Gardens attached, let at an annual rental of £17 10s. Also a Piece of GROWING WHEAT (Spalding New Seed), about 1¼ Acres, Straw to go off; Rick of NEW HAY, got in excellent condition, about 9 Tons; NEW MILCH COW, IN-PIG SOW, ferret and box, rifle by Moore and Woodward, Carbine, 4 Arabian and other bedsteads, mahogany dining table, night commode, butcher's bench, thralls, ladders., sack barrow, skittle pins and ball, pig trough, set of rick poles, gates, doors, double-action chaff machine by Ashby and Jeffery, iron hone hoe, ten-hogshead barrel, six-hogshead ditto, 2 two-hogshead ditto, small barrels, 6 brown jars, pickaxes, dung fork, cart ropes, angle irons, grindstone with oak frame, 4 cast-iron wheels, flywheel, 2 wheelbarrows, quantity of slabs, several dozen hurdles, 30 dozen fagots, 8tons of cleft wood, 20 dozen elm paling, large quantity of elm and other boards, quantity of beech, 1000 feet of ash and willow fencing, quantity of scantlings wire fencing with iron pegs, rose supports, draining tools, 2 cross-cut saws, carpenters’ bench, beetle and wedges, 1 gross of bolt, and nuts, gate hooks and hinges, iron cow ties, chains and back bands, quantity of old iron, &c. &c.
Sale to commence at Twelve o’clock with the Stock, after which the Property will be sold, subject to such conditions of the sale as will be then and there produced. On Monday last George Curl, gardener, Cosgrove, was bringing a perambulator, containing two baskets of apples to Stony Stratford, and, when near to where the old toll gate used to stand, on the Cosgrove-road, fell down, and instantly expired. The following day an inquest was held at the Barley Mow, Cosgrove, before A. Weston, Esq. Ann Burnham said her father was 61 years of age. He lived by himself, and she attended his wants. On Sunday evening he complained of spasms in his left side, but otherwise appeared well as usual. George Jeffcoat deposed to finding deceased. Dr. Bull, of Stony Stratford, was passing, and be examined him, and pronounced life extinct. Dr. Maguire, surgeon at Stratford, knew he had bronchitis and heart disease, and cautioned him to be very careful if he went to work. He had not the least doubt he died from heart disease.Verdict accordingly. IN BANKRUPTCY. Re Joseph Price. 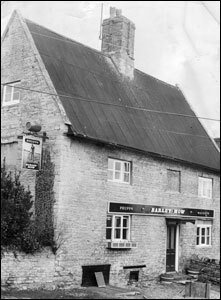 THE BARLEY MOW, COSGROVE, Northamptonshire. Sale of 50 LOTS HOUSEHOLD FURNITURE and other EFFECTS. By order of the Official Receiver in Bankruptcy. Re Joseph Price, of Cosgrove, Northamptonshire, publican and harness maker. The first meeting of the creditors this debtor was also held on Tuesday. The debtor's liabilities were put down at, £205 the assets £54 5s. 11d., and the deficiency £150 17s. The debtor stated that he commenced business September 29, 1879, with a capital of £128. No resolutions were come to, and the Official Receiver was continued trustee. Re Joseph Price, Cosgrove, Northamptonshire, publican and harness maker. This debtor came up for public examination. Mr. J. Banks represented the debtor, who stated in reply to the Official Receiver, Mr. W. G. Carter Mitchell, that he entered into his public-house about eight years ago. He had £128 capital. He paid £10 to the tenant and £68 for the fixtures. The debtor was not tenant now. He had deficiency of £102£54 assets and £156 liabilities. It was two years since he first knew he could not pay 20s. in the £. He did not think he owed more now than he did two years ago.This closed the public examination of the debtor. In connection with the Stony Stratford, Wolverton, and District Wholesale Clothing Society, a dinner was held at the Barley Mow Inn, Cosgrove, on Saturday evening, when about fifty members of the Cosgrove branch was present. A capital cold collation was provided by Host H. Willison. The chair was taken by the manager of the society, Mr. W. A. Anchor.The Chairman submitted "Success to the Society," which was heartily drunk, and Mr. Anchor, in reply said he would do his best to look after the welfare of the members."The Health of Mr. Anchor” was also drunk and Mr. Anchor having acknowledged the compliment the room was cleared for dancing. THE INQUEST. Mr T M Percival inquired into the circumstances of the sad affair at the Barley Mow on Thursday. Charlotte Brown, wife of Albert Brown, of Cosgrove, drayman, said that Tuesday she left her house go to the barn at about a quarter to seven in the morning. 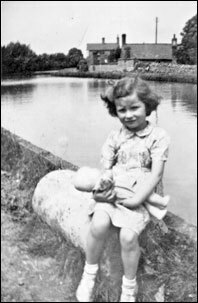 She was going to do some washing, and left her two children, William, aged three years, and the deceased, Frederick Albert, aged one year and seven months upstairs fast asleep. When witnesses left her husband was at work. A lodger was in the house reading the paper. He said he heard nothing of the children, and when he left everything was quiet. Witness went back to the house about 7.30 staying a few minutes and writing a note. She listened, but all was quiet, and she assumed the boys were still asleep, and she went back the barn. Later a Mrs. Key, who lived next door, said the children seemed quiet. Witness then told her she was going back. They got to the door she said, “They are screaming.” Witness rushed upstairs, and found the deceased in flames. She picked him up, took him into the yard, and put him into some water. The other boy followed downstairs. He was not burned at all. She added that the bedclothes were fire, and she threw them out of the window. There was a candle alight in the lodger's room where the children were. Continuing, she said William had that morning told witness that he struck the matches and lighted the candle. He told her how Fred stood, and that he got frightened and hid under the bed. Witness sent for the doctor at once, but her child died the same day. Dr. Powell said the child was terribly burnt all over the body and more particular on the front of the abdomen. The child was absolutely hopeless from a curative point of view. The cause of death was shock arising from extensive burns. The jury returned a verdict in accordance with the medical testimony. Sunday last was observed in this Northants village as Feast Sunday. Special services were held in the Parish Church which was well attended, likewise the services at the Mission Chapel which were as usual bright and hearty. In the evening the Band of the Bucks and Oxon Light Infantry (Territorials) gave a special programme of music under the baton of Mr. H. Brooks in the presence of a very large crowd and which was greatly appreciated. On Monday evening a large number of people gathered in Mr. Bushell’s “Barley Mow” field where billings roundabouts and shows were located. An aged Cosgrove resident, Mrs. David Smith (75), widow, met her death under somewhat sudden circumstances on Saturday. It appears that the old lady, who lives alone, became very seriously ill whilst following her household duties on Friday evening, which illness forced her take to her bed. Mrs. Lambert, a near neighbour, undertook to nurse the old lady, and she remained with her until she died in the early hours of Saturday morning. At the inquest, conducted Mr. K. Whitton, held at the Barley Mow Inn, Cosgrove, on Saturday evening, Dr. Brawn, Stony Stratford, gave evidence of a post-mortem examination which had revealed the fact that deceased had suffered from acute indigestion, and that death was due to heart failure. Thomas Smith, 23, Osborne-street, Wolverton, identified the body as that of his mother, and a verdict of Death from heart failure was returned. THE OUTBUILDINGS include Two Stables, Barn and Four Pigsties. Apportioned Rental of £47 per annum. Land Tax £2 8s. 6d. on this and Lot 15. 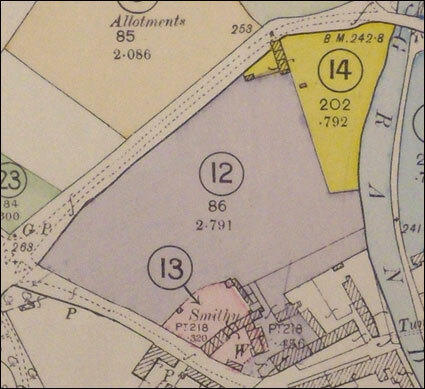 Lot 12, the Barley Mow Inn, 3a. 1r. 0p., sold Mr. Phipps for £900. The Barley Mow on the left and the road leading down to a narrow walkway under the canal. 2 miles from Stony Stratford. Freehold land, adjoining the Canal and Bridge near the centre of the village, comprising O.S- No 70 (1926 Edition) in the above Parish extending to 9 ACRES 3 ROODS 22 POLES (or thereabouts) of which 5 acres and 22 poles on the frontage are let as allotments to the Cosgrove Allotment Committee, at an annual rental of £15 11s. 8d., payable half-yearly at Ladyday and Michaelmas, and the remaining 4 acres and 3 roods are in the occupation of the Vendor, who will give VACANT POSSESSION at Michaelmas next, or as soon as the present crop of wheat has been taken off. The frontage of 150 ft, (approx.) forms a VALUABLE BUILDING SITE and the Allotment tenants could be reinstated on the vacant land to the rear. Tithe free. Land tax 9s. 5d. Lot 2. THREE BRICK AND SLATED FREEHOLD COTTAGES situated or The Green, each containing: 1 Living Room, Kitchen. 3 Bedrooms, Outside Barn and Closet with gardens in front and at rear, let to Mrs. Toombs, Messrs. Swain Bros, and Mrs. Hill, the two end Cottages will be offered, WITH VACANT POSSESSION. Land Tax £1. Gross Rental £28 12s. 0d. To be offered for Sale by Auction on MONDAY. JUNE 2. 1947. at THE BARLEY MOW INN. COSGROVE at 7 P-m. (if not previously disposed of). To view apply the Auctioneers; HOWKINS, SONS & FATT, 7, Derngate, Northampton (Tel. 2426) and at Rugby and Daventry. Solicitors Messrs. Dennis. Faulkner and Alsop, 17, Market Square, Northampton (Tel- 3000). 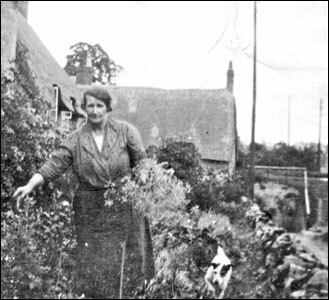 Barley Mow Cosgrove, Mrs. Frances Ellen Bushell, from her late husband. Cosgrove Football Club on Saturday set an example which other clubs might well follow. The club held a supper to celebrate the winning of a league championship, and only one speech was made. Usually at gatherings of this kind the greater part of the evening is taken up with speeches that none of the company want to hear. A supper and smoking concert took place at the Barley Mow Inn, Cosgrove, on Saturday in celebration of the success of the Football Club in winning the championship of Division II of the North Bucks League. About 60 were present and Mr. J. W. Gee, the chairman of the league, who presided, congratulated the team, but this was the only speech, and the evening was given over to harmony. Percy Joseph Horn, grease maker, Barley Mow, Cosgrove, was summoned tor aiding and abetting. P C Bonner stated that he saw Noble driving a motor-car with Horn beside him. They stopped near the Gas Works, and then came on again. When witness stopped the car, Horn produced his licence, and Noble said he had a licence. Horn said he was under orders to teach Noble how to drive a car. The Clerk; It was obvious to you Noble was having lessons? Yes. Noble informed the Bench that did not think it mattered about a licence when learning. Horn said he told Noble he would have to get a licence. When they saw three policemen along the road he said to Noble: “They will think we are Browne and Kennedy if we turn round now," so, added defendant, they went right past the policemen.The Bench ordered both defendants to pay costs. Are instructed by the Administratrix of the Estate of the late Mr, J. J. 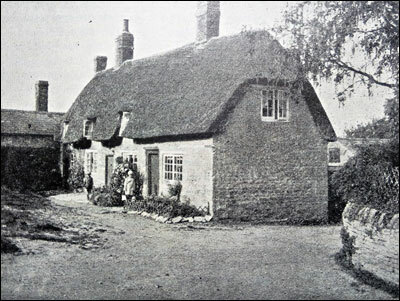 A SEMI-DETACHED COTTAGE and GARDEN, occupied by Mr. Hinton. COTTAGE and GARDEN, tenanted by Mr. Harry Barby. For further particulars and conditions Sale, apply to the Solicitors: Messrs. PARROTT and SON, Stony Stratford and Wolverton; Messrs. WORLEY and CO., Stony Stratford; or to the Auctioneers. Winslow, Bletchley, and Stony Stratford. Myrtle Cottages are in the background. 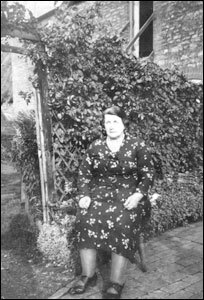 Frances Bushell in the garden, behind her is the upstairs room where the football club used to meet. Blind Darts team at Cosgrove. A verdict of death by drowning while the balance of mind was disturbed was recorded by the Coroner for South Northamptonshire (Mr. J. S. Budge) at an inquest held on Tuesday at the Barley Mow, Cosgrove, on Percy Swain, of The Green, Cosgrove. Ernest Swain said he lived with his brother, who was 55. They were both leather dressers. For the past two weeks his brother had been very depressed. Last Tuesday night when witness went to bed his brother was reading the paper. The next morning he found his brother was missing. Witness made a search, but could not find him, so notified the police. He found a note among some papers which stated that his brother intended to take his life. In it his brother said that his nerves had given out. Dr W. M. M, Douglass said he saw the body on Tuesday and thought death had occurred four to six days previously. The cause of death was drowning. Swain had been to see him, had said he was worried, but was not very communicative. Witness could find nothing wrong with him physically. Richard Longman, 6, Bridge-street. Cosgrove, gave evidence of seeing the body in the river about 50 yards from the mill basin. Mr Budge said the note Swain had left showed his mind was unbalanced. For about three months the customers of the “Barley Mow”, Cosgrove, will have to visit the "Barge” inn, for their drink. On Monday last the “Barley Mow" closed in order that internal structural alterations can be carried out to bring the house up to more modern requirements. When that work is carried out, Messrs. P. Phipps and Co. will close the "Barge” which has served the village and bargees for over a century. 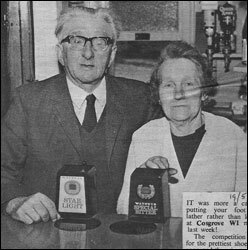 Mrs. Bushell and her late husband have been licensees at the "Barley Mow" for 23 years. Mrs. Bushell is to live with her son, Archie, who is licensee of the "Anchor " inn, Potterspury. 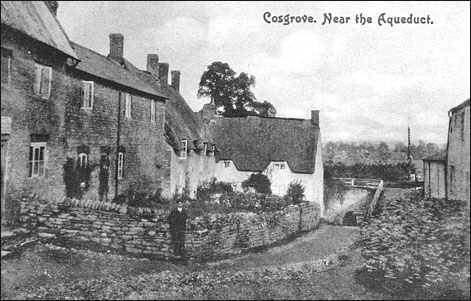 For many years there were three licensed houses in Cosgrove. The " Plough” was closed about two years ago. All three houses belonged to Phipps's. WHEN Sidney Eglesfield was a boy, beer was 3d a pint. He remembers it well - he was born in a pub. Sidney is 67 now and the price of beer has gone up a bit. He still drinks it of course but he gave up living in a pub on Monday. Sidney has retired as licensee of the Barley Mow pub in Cosgrove and gone to live at 31 Manor Close. 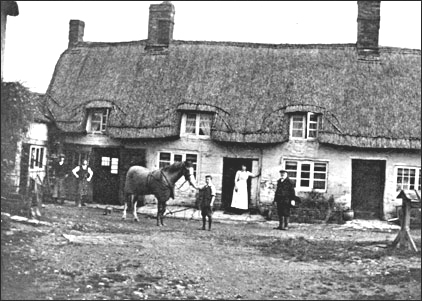 He is picture above with his wife Ada at the pumps of the Barley Mow. He was born in The Barge at Cosgrove where his father was licensee and ran the pub for 10 years until it closed in 1955. He has been at the Barley Mow for 17 years. Looking forward to a rest "When you get to 67 you are entitled to a rest," said Sidney. "It was getting a bit too much for me. I was getting more trade than I could handle and I am looking forward to putting my feet up and having a rest." He is also a keen gardener and looking forward to the big garden in his new house. Sidney has two daughters and a grandchild. The new licensee of the Barley Mow is Mr. George Parker Becket of Rotherham. PROCEEDS from Cosgrove Flower and Produce show held at the Barley Mow on Saturday will provide a Christmas film show for the Senior Citizens Golden Hour Club. Net proceeds from the show, from the sale of exhibits and gifts, raffles and cash donations, and after deduction of prize money, was £19.30. Mr. Gerry Runacres who organised the show also runs the film show. 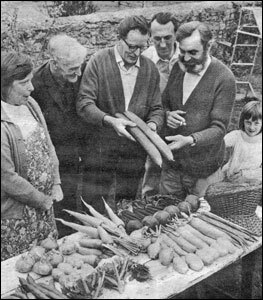 Judges for the show were Mr. Bob Coulson of the White Swan, Stony Stratford for the vegetables, fruit and flowers, and Mrs. G. Beckett of the Barley Mow Cosgrove, for the domestic and children's classes. Cash donations were received from Mr. E. Lambert, Mr. E. Brown and Mr. G. Runacres. Prizes for the raffle were given by Mr. George Beckett, landlord of the Barley Mow, and Mrs. Jean Runacres. Raffle winners were bottle of gin, Mr. P. Hickford, box of groceries, Mr. M. Hickford; cake. Mrs. Gayton; bottle of beer, Mr. P. Lyman. Cosgrove’s village pub “The Barley Mow” has been given a facelift. The alterations to the 200 year old pub have been made by the new licensees, John and Margaret Harwood, who moved in about six months ago. The couple, who have a six year old son, Simon, come from Kettering, and the Barley Mow is their first pub. Although John was formerly in the catering business, working for British Transport Hotels on sales and marketing. “We are doing a full range of lunches and evening basket meals,” John told me. 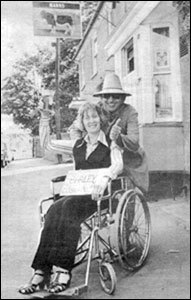 Landlord Gordon Cowley, of the Barley Mow, with passenger Nancy Forsyth. TWENTY landlords from South Northants took some time off from behind the bar on Sunday and joined in a sponsored wheelchair push. The annual Publicans’ Push organised by Towcester Lions and the Licensed Victuallers’ Association raised around £1,500. The wheelchairs and passengers were from Northampton's Gladstone Centre for the disabled. The shield for the best fancy dress entry went to Mr Gordon Cowley, land lord of the Barley Mow, Cosgrove, who disguised himself as a barley mower. The cash raised will be split three ways, between the Gladstone Centre, the LVA and Towcester Lions Charity Account. THE new husband and wife team behind the bar of the Barley Mow at Cosgrove intend to keep their customers happy with plenty of home cooking. Terence and Susan Murphy moved into the pub on Monday from their previous home at the Bell Inn, Tong, Shropshire. The couple have been in the licensed trade for the past 14 years, first with Trust House Forte, now with Mann's Brewery. Terence, 33, says he was attracted to Cosgrove because he likes canals. Susan, 33, was famed for her home cooking at their previous pub and her speciality is a delicious steak, kidney and mushroom pie.